Ochazuke is a very Japanese dish. In the most basic form, ochazuke is just hot tea poured over rice. It is more common though to included other topping items such as seaweed, salmon flakes, ume, etc. I usually eat ochazuke for breakfast, however I was informed that it isn’t necessarily a breakfast dish. It can be eaten at any meal, and many times at the end of the meal. 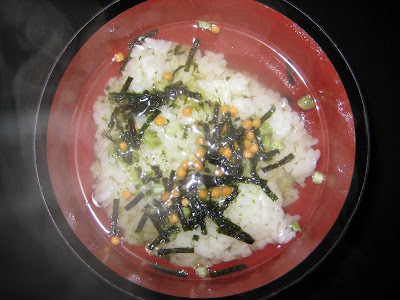 Also, it is not uncommon to eat ochazuke when you have a bad cold, or even after a drinking party. My personal favorite ochazuke flavor is the one above, wasabi. The spiciness of the wasabi gives it a little bit of a kick. 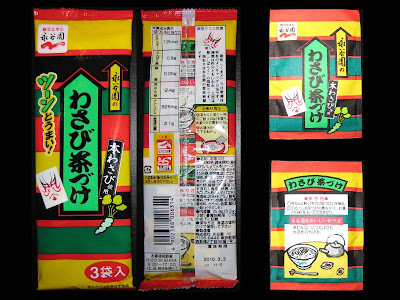 The brand of wasabi ochazuke pictured above is a little hard to find. It’s good to know the local 100 yen shop carries it. If you're looking for Japanese stuff, I strongly recommend you to check out Japan Best, it is great Japan-import store, and the ship worldwide.